Most American cities have at least one street like Atlanta’s Buford Highway: a mixed-use corridor developed decades ago on the assumption that people would drive everywhere, but which over time came to house many people who can’t afford cars. When they have to navigate a place designed only for cars, that’s a very dangerous combination. Buford Highway is in fact the most dangerous road in the Atlanta region, averaging multiple pedestrian deaths each year and many more injuries. “Buford Highway” is what Atlantans call State Route 13, which runs 50 miles from Midtown Atlanta to Gainesville, Georgia. The busiest part is a six-mile stretch just outside Atlanta city limits, running through the inner-ring suburbs of Doraville, Brookhaven, and Chamblee. These cities mix relatively affordable housing with a lot of retail businesses. That’s where people are getting killed. MARTA’s most heavily-used bus route travels this corridor. Riders must contend with terrifying conditions for walking. Many areas lack sidewalks. Crosswalks are few and far between. Where sidewalks do exist, they are saturated with curb cuts and driveways. The dangers of Buford Highway are no secret. In 2011, when PBS produced a documentary on pedestrian safety, it chose to feature Buford Highway. But in part because the road cuts through a number of municipalities, comprehensive safety improvements are especially challenging to implement. The suburbs along the highway started out as small towns, which grew rapidly during the heyday of autosprawl in the 1950s. Over time, they have been settled by waves of immigrants, first from southeast Asia (locals have nicknamed Chamblee “Chambodia”), then later from Korea, and finally — when the 1996 Atlanta Olympics sparked a building boom — from Mexico and Central America. These immigrant communities set up businesses along the corridor, and Buford Highway is now a thriving regional ethnic food destination. The planning effort coming together now has two main objectives: to make Buford Highway safer, and to prevent the displacement of its immigrant communities and their businesses. 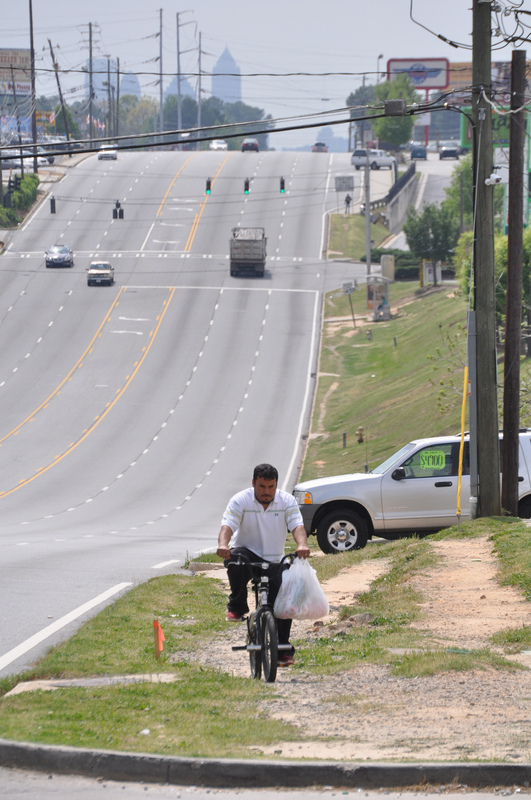 Chamblee and Doraville had each been planning to tackle the safety problems on the road, so the Atlanta Regional Commission (ARC) stepped in last year to fund a joint effort to “address connectivity, affordable housing, and pedestrian safety” on six miles of Buford Highway. The February 2016 grant has produced a plan that calls for converting the two outside lanes to space for walking and biking over the next 10 or so years. One reason implementation is expected to take so long is that turning Buford Highway into a walkable street is a lot more complicated than changing the signs and lane markings. In addition to more generous and uninterrupted walking and biking space, the plan calls for traffic signals that prioritize buses. But the final Fortner estimates it will be five years before the bus lane is installed, and that is considered a preliminary half measure. In public meetings, additional sidewalk and biking space emerged as a bigger priority. The conversion of the outer lane to a bike and pedestrian space is maybe 10 years out, and will include features like signal priority to help speed along buses, Fortner said. In the meantime, an organization called We Love BuHi is working to build trust between the officials planning infrastructure changes and the people who live and work around Buford Highway. Marian Liou, a Brookhaven resident, founded We Love BuHi to support the immigrant businesses that earn a living on Buford Highway and draw customers from around the region. They haven’t always been receptive to safety improvements on the street. 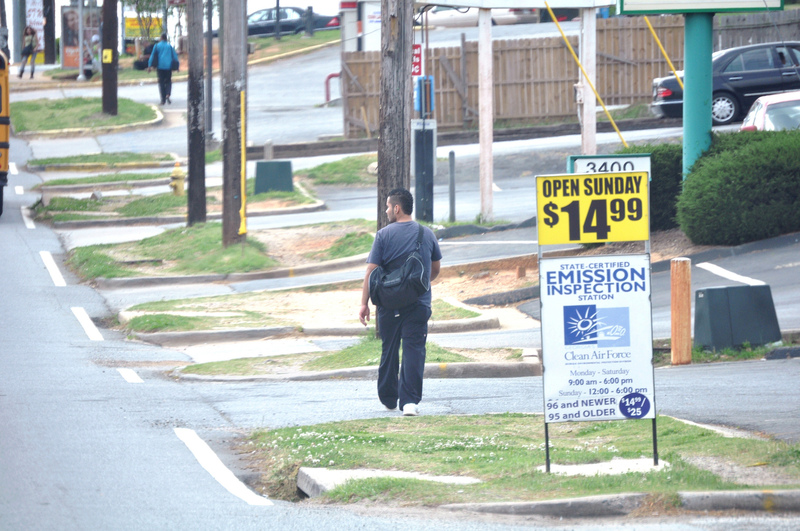 In Doraville, an older GDOT-backed plan to add medians and install crosswalks was rejected by Korean business owners worried about losing customers who drive, said Liou. They weren’t convinced the plan would help them. “How will we educate and inform businesses and property owners who are usually not included in this process so their response will not be one of fear?” she said. One way We Love BuHi is doing that is through public art. 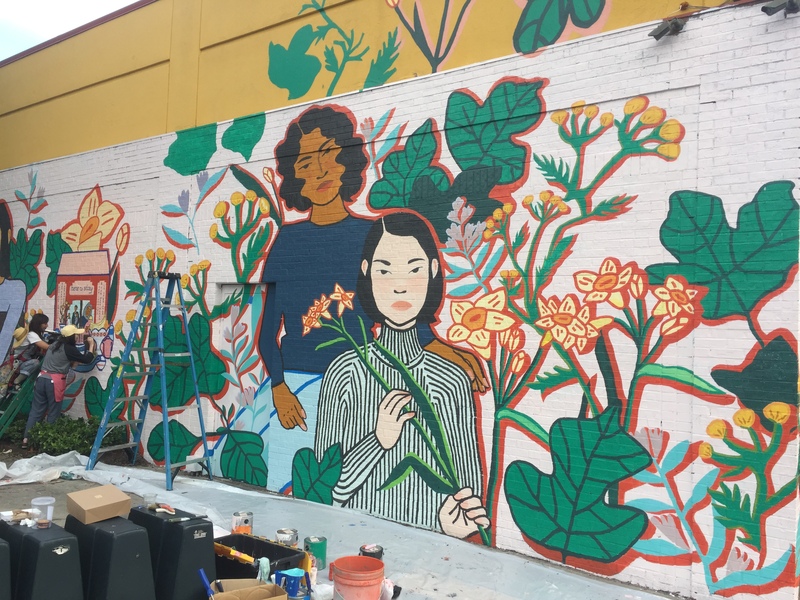 Working with artists through the non-profit Living Walls, the organization has commissioned a number of murals celebrating the different immigrant cultures along Buford Highway. One goal of the murals is to generate more foot traffic for businesses by creating a more welcoming pedestrian environment. 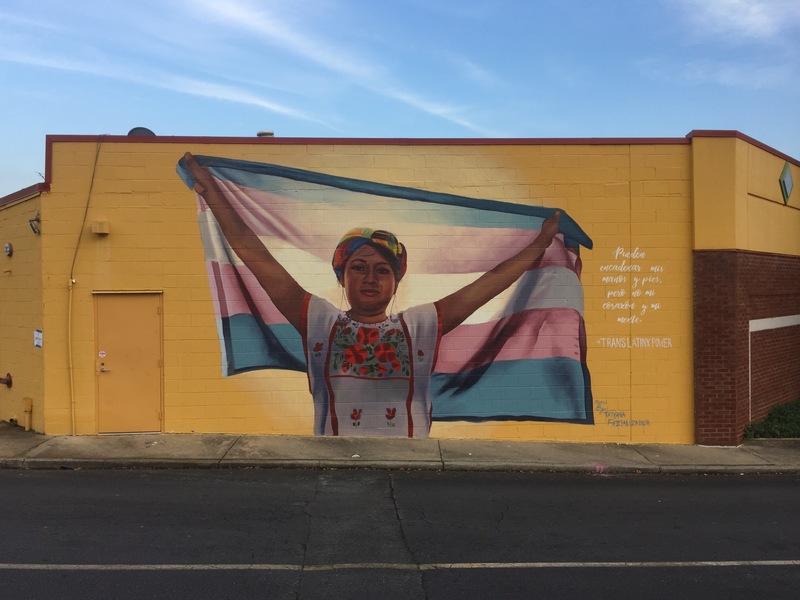 With many of the retail storefronts separated from the street by large parking lots, and few clear, safe paths to navigate while walking, the murals humanize an intimidating landscape for people on foot. We Love BuHi and Canvas will be adding other features to bridge gaps between storefronts and the street, like colored asphalt and an outdoor seating. 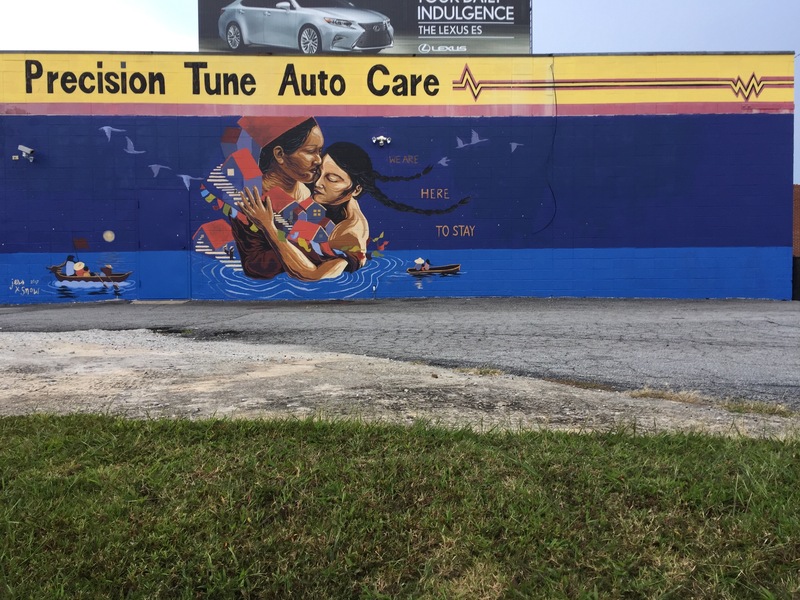 The other goal of the murals is to stake a claim to Buford Highway for the immigrant communities that have settled there. As portions of Atlanta gentrify and become less affordable, there are concerns that the same pressures will affect Buford Highway and erode its cultural heritage. So the project leaders are trying to get ahead of it. Liou and Fortner don’t think they can stop change. But they want current residents to be able to enjoy a safer, walkable Buford Highway. To maintain affordable rents, for example, a proposed rezoning would create incentives for developers to set aside housing for low-income residents. “In other cities when redevelopment comes to the immigrant area, these big improvements don’t benefit who was there already,” said Liou. That’s not good enough for Buford Highway. As soon as a pedestrian “fail trail” appears next to a road, that should be a good indicator to the municipality that it’s time to install a sidewalk on that street. Holding off installation of sidewalks due to curb cut elimination is letting the perfect be the enemy of the good. Agreed. These began appearing here 30 years ago. So, that’s the level of municipal disregard we’re up against. If I was planning Buford Highway I would recommend getting rid of as many curb cuts as possible by allowing for as much side to side movement through parking lots as-possible, then widening the road by at-least one lane and installing a center grassy median of at-least 20-24 feet in width, and then forcing U-Turns and right turns like quite a few of Metro-Detroit’s boulevards. At least that way pedestrians would only be forced to cross 3 lanes to reach the median. Because just 3 lanes per-side would not be enough for large 18-wheel trucks to make 180-degree turns such U-Turn lanes would have to be planned to allow a paved turnout on the right side of the opposite direction roadway wide-enough for heavy trucks to complete their turns on pavement as shown in this Google Earth photo. I am thinking that bus pull-offs would be safer than on-street bus stops too. The road shown is Coolidge Hwy in suburban Troy, MI between Big Beaver Rd (16 Mile) and Maple Rd (15 Mile). The extra paved space is so that large trucks and city buses can make U-Turns and stay on the pavement. Yes, sidewalks and bike lanes would be helpful also, though I am a fan of separating bike lanes from traffic lanes and/or installing bike lanes on side streets so that bike riders aren’t forced to breathe too much pavement dust, brake dust, oil and grease particulates, and too much exhaust, which on down the road will likely create a greater than average incidence of bicyclist lung issues too. I would also have to study the current and forecast traffic load to know whether 3 lanes per-side would be able to handle the load or whether just 2 lanes in each direction with a transit lane would suffice. It might be helpful to know what the design capacity of Coolidge Hwy in Troy is. Here is the intersection of Big Beaver Rd (16 Mile Rd) and Coolidge Hwy in Troy, MI about 18 miles northwest of downtown Detroit. Both roads are 6 lanes divided at the intersection with right turns only and median U-Turns rather than left turns allowed. Note the separation to the sidewalks. Who on earth ever thought it was a good idea to not even have a modest shoulder on those roads? Ugh. This rises to level of a civil rights issue, those conditions for walkers and cyclists are just all kinds of wrong. This also just seems like such an absurdly clear-cut case for eminent domain, not to mention I don’t see why the property owners would complain since you’re taking the costs of the upkeep of the curb cuts off their backs. God save us all from Marian Liou and her ridiculous buhi name and utopian-kumbaya ideals.